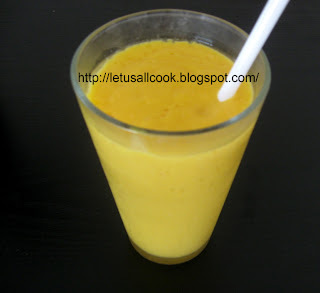 Mango Milkshake/Smoothie - A Refreshing Summer Drink! Its summer time! Most of us will be stocking our fridge with drinks,Soda etc. With summer it is pure enjoyment. Playing, outing, walking outside, sitting in the patio for long time....those we can't do in winter! With summer in mind, there are a lot of events taking place in this food blogosphere. Now here is my humble contribution to few of the events, Mango Milkshake/Smoothie. Peal and cut the mangoes into small pieces. In a blender, add these mangoes, sugar, milk, yogurt and salt and blend it for 3 to 4 minutes. The more you blend the more creamy and juicy the milkshake/smoothie will be. Refrigerate it for 30mts and enjoy! thats lovely.. but why u r not sending it to WBB-summer feast i am hosting? All time favourite! Presented well too! way to go with ur mango shake, sangeeth!! looks thick and refreshing!